Euonymus europaeus is a deciduous plant that can be grown as either a large shrub or small tree. It is native throughout Europe and into the western regions of Asia and has been cultivated in North America where it has thrived to the point of becoming an invasive species in some areas. It is known for the brilliantly colored foliage and fruits that appear in the autumn. Although birds can eat the fruit of this species, all parts of this plant are toxic to humans if eaten in sufficient quantity. The juice is even used in some parts of Africa to create poisoned arrows. Oil produced from this plant is used for soap making. The seed coating is used to create a yellow dye and charcoal obtained from the wood is prized by artists. The scientific name of this species is Euonymus europaeus, which is said by some to be derived from 'Euonyme', the mother of the Furies, a reference to the poisonous nature of this tree. This plant is most often known as the European spindle tree, a name that comes from the fact that the stems are hard and at one time were sharpened into weaving spindles. 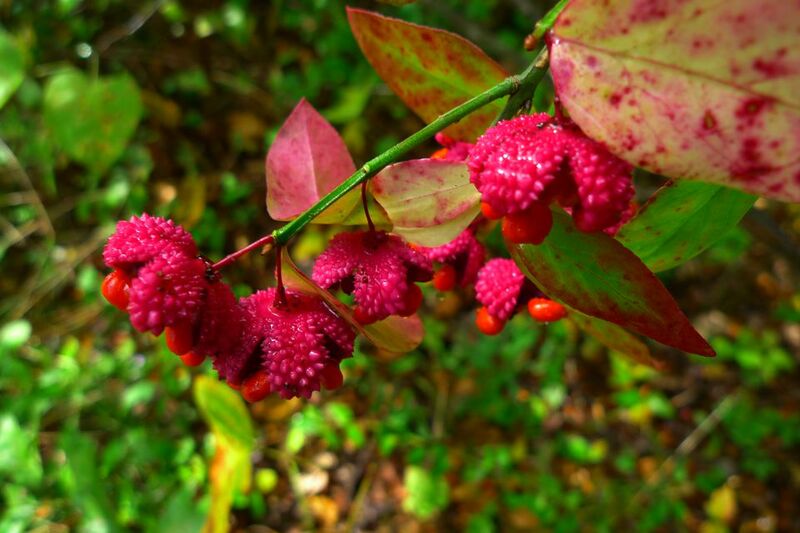 Often simply called the spindle tree, it has other common names including European euonymus, prick timber, prickwood, and spindleberry. It has also been referred to as “robins' bread” because robins attracted to the seeds will fiercely defend a bush they have claimed as their territory. European spindle tree is very cold hardy and will grow in USDA zones four through seven. Usually grown as a large bushy shrub with multiple stems growing from the base, it will grow to as much as 20 feet high and spread nearly as wide. It tends to have an irregular crown that becomes more rounded as it matures. It is possible to prune it to a single stem, creating a small tree shape. European spindle trees prefer full sun to partial shade. If grown in full shade, this species will exhibit diminished coloration in the fall when it should be the most striking. It should be planted in an area of well-drained soil. The stems are smooth and dark green with dark green elliptical leaves. The leaves are slightly serrated and grow two to four inches long. In the fall, the leaves turn yellow-green to red-purple. The yellow-green flowers bloom in May and are not particularly notable. It is the fruit that follows in the fall that this plant is known for. Initially a pale colored lobed capsule, as it matures it deepens to a hot pink-red color by autumn. Eventually, the fruit capsule splits open to reveal a red-orange berry with dark red seeds. This species makes an attractive background shrub with a flowering border in front of it. European spindle trees also pair well with ornamental grasses. It makes an excellent winter border for early flowering bulbs. To produce more abundant displays of fruit, it is recommended that this species is planted near another Euonymus europaeus cultivar for cross-pollination. In the spring, prune it back to the desired shape and size, then mulch the base of the plant. If a tree form is desired, select the strongest shoot and cut all other shoots to the ground. Stake the single remaining shoot and when it reaches the height at which you want the tree foliage to begin, pinch off all growth below that spot. Continue trimming as needed to achieve desired growth pattern. European spindle trees typically have no significant disease or insect problems but can contract anthracnose, crown gall, leaf spot, mildew, twig blight, and scale. It is particularly attractive to certain aphids.